TAG Heuer is one of the most popular brands sold at www.AuthenticWatches.com. The models described below are all exquisite timepieces from some of TAG Heuer’s most sought-out collections, and each offer different features and functions to suit a variety of users’ needs. 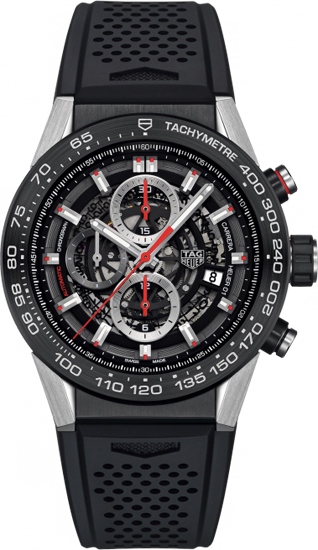 While these are certainly not the only TAG Heuer collections we sell, this article can serve as an introductory guide for anyone who is interested in learning more about TAG Heuer and some of their vast offerings. 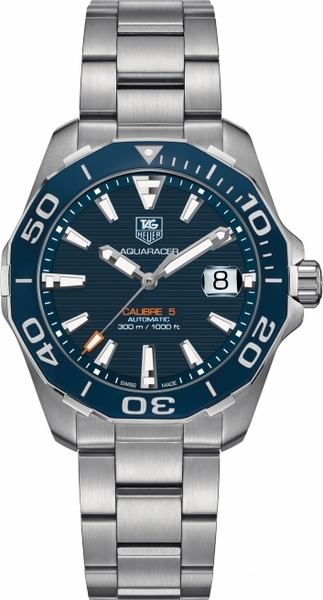 The TAG Heuer Aquaracer Collection is a best-seller on www.AuthenticWatches.com. This particular TAG Heuer Aquaracer (WAY211C.BA0928) is the ultimate sports watch with a screw-down crown and case back that provides up to 300m (1000ft) of water resistance. The timepiece features a blue dial with orange accents and blue bezel set on a brushed and polished stainless steel case affixed to a brushed steel bracelet. A 41mm case and luminescent hands and markers make the TAG Heuer Aquaracer easily legible at any time of day without being overly bulky or sitting heavily on the wrist. This watch is powered by the TAG Heuer Caliber 5 self-winding automatic movement and is a wonderful option for anyone looking for a classic and functional timepiece for everyday use. The TAG Heuer Carrera Collection is just as iconic as the Aquaracer series, but was designed with race car drivers and enthusiasts in mind. This TAG Heuer Carrera Heuer 01 (CAR2A1Z.FT6044) has a sporty, contemporary appearance with a black skeleton dial and a sapphire crystal exhibition case back that showcases the TAG Heuer Caliber 01 self-winding automatic movement. The timepiece has several features specifically geared towards car racing, including a chronograph and a tachymeter scale. The watch has a large 45mm face and a black case made of titanium carbide-coated stainless steel. This TAG Heuer Carrera features a comfortable black rubber strap that pairs beautifully with the intricate, unique dial of the timepiece. The TAG Heuer Link Collection is very popular among men and women alike. This collection is characterized by its sophisticated, elegant design and the Link bracelets are widely considered to be among the most comfortable bracelets offered by TAG Heuer. This TAG Heuer Link (CAT2010.BA0952) has several features found on the TAG Heuer Carrera, such as a chronograph and tachymeter scale, and a brushed stainless steel case and bracelet similar to that on the TAG Heuer Aquaracer. The screw-down crown and case back provides water resistance up to 100m (330ft), while the avant-garde, geometric appearance makes the timepiece perfect to dress up or down. This TAG Heuer Link model is powered by the TAG Heuer Caliber 16 self-winding automatic movement, but the general collection offers both automatic and battery-operated quartz movements. TAG Heuer watches are renowned for their durability, accuracy, and style. At the forefront of innovation, TAG Heuer offers a diverse line of timepieces with a wide variety of movements for men and women alike. TAG Heuer timepieces are suited for any occasion, and are a must-have accessory for the distinguished wearer. 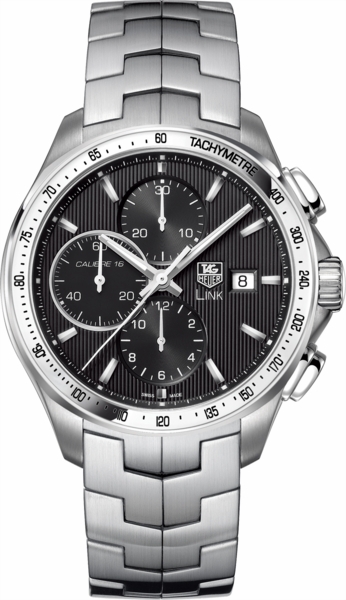 Find your perfect TAG Heuer timepiece at www.AuthenticWatches.com! Shop all TAG Heuer models. This entry was posted in Brand Name Watches and tagged Aquaracer, authentic watches, authenticwatches, automatic, automatic watches, automobile, avant-garde, battery-operated quartz, black dial, blue, blue dial, caliber 01, caliber 16, caliber 5, CAR2A1Z.FT6044, carbide, carbide coding, carrera, CAT2010.BA0952, chronograph, diving, fashion, link, luxury, luxury watches, quartz, rubber strap, sapphire crystal, self-winding, stainless steel, subdials, tachymeter, tag heuer, tagheuer, timepieces, titanium, water resistant, WAY211C.BA0928. Bookmark the permalink.